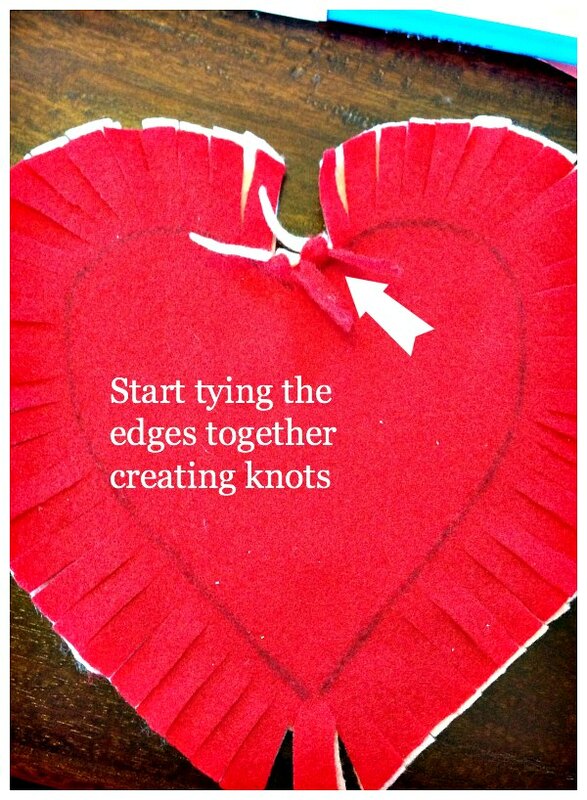 How about a DIY Felt Heart Craft Idea that requires no sewing! 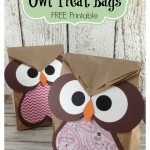 This project is perfect for kids. I made this simple project for my daughter and she loves to sleep with it at night. She swears it makes her feel warm and cozy! This project really doesn’t take much to make either. 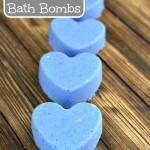 I would say it costs us under $1 to make too. First we took a regular 8 x11 sheet of paper and drew a heart on it. This is the paper template you will use to cut your heart out. Then we drew a second heart in the middle of the paper. 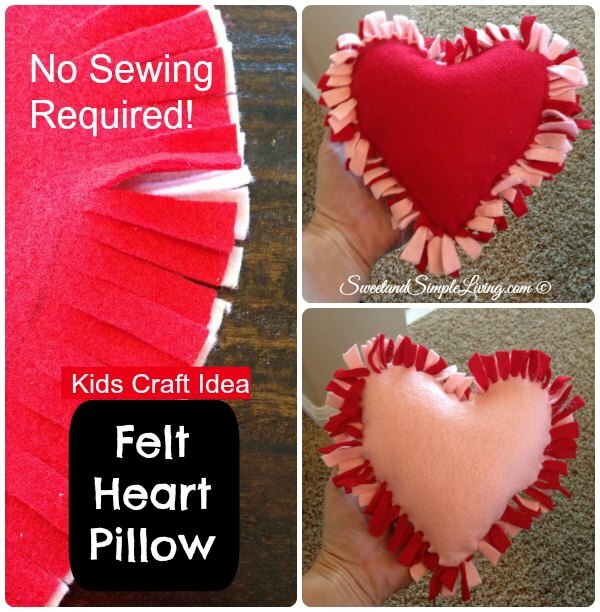 Now cut out the felt heart shapes as seen in the photo below. We stacked both sheets of felt on top of one another so when we cut them out from the template they would be exactly the same. Next we traced the inside heart on the felt with a erasable pen. The erasable pen required a little wet towel to wipe off. Chalk would also work. 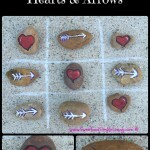 You are tracing the inside heart because you need to know where to stop cutting your strips at. 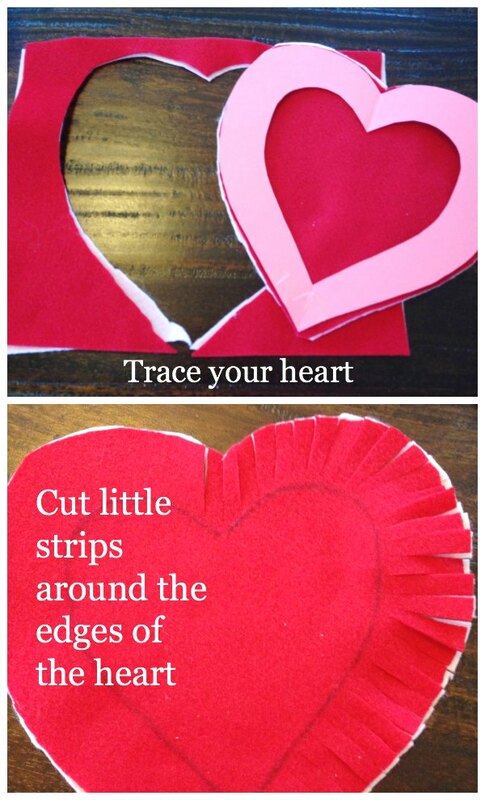 Next, start cutting strips around the outside of the heart (as seen in the photos). Tips: I started out cutting at the bottom of the heart where the point is so that I could make sure the bottom was not off centered. I also made sure to cut the strips very thin to make sure my fingers could tie it in a knot. The thicker the strips the harder it was to tie a knot. The strips I cut where 1/4 inch wide. Finish tying the ends but when you are almost 75% done be sure to leave a little opening for a hand full of stuffing. You need very little stuffing for this project. We always like to recycle old stuffed animals that are no longer wanted. We actually took a small stuffed animal and reused it’s stuffing for this project. 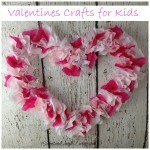 This would make an excellent homemade Valentine’s Craft idea for kids! 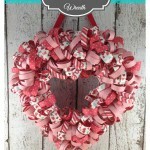 You could even take this craft idea to the next level and add some pretty craft jewels to it! Maybe even use some crafting glue and glitter too. The best part about this project is the sense of accomplishments the kids feel from making something special for a loved one. That is priceless. 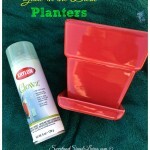 If you need more Craft ideas you need to check out the The Complete Book of Arts and Crafts. It’s a good one! i love these cause i made blankets for my hubby and son for christmas last year football teams and they loved them we use them every day no sewing my favorite ,so i need to make some of these for my grandchildren they would love them we have a set of twins girl /boy and a 7 year old grandchildren and the little ones love hugging soft animals and pillows…so i know they will love these…thank you …. These are SO cute! 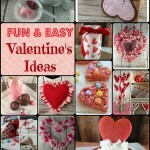 I was hoping to make these in my 4th grader’s classroom Valentine Day party. I tried it this morning and the knots are extremely tiny which made it virtually impossible to pull off. I made a larger one and that was still very difficult to tie, and it took me an hour from start to finish. Not nearly as easy as doing a tie-off larger blanket. Thanks for the idea though…very cute! 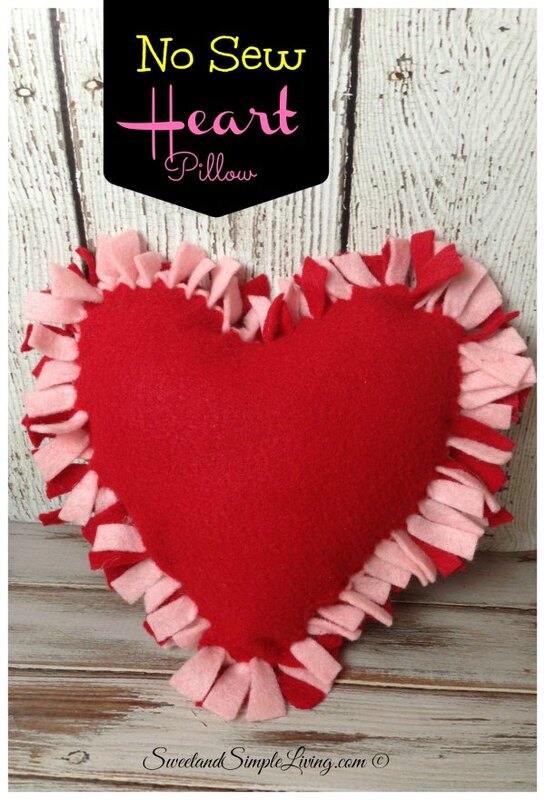 You could do this with larger pieces of fleece to make a bigger pillow. These kids have to be old enough to tie a knot. That’s how I would judge it. For little ones I would recommend felt glue! Available at most craft stores. I love these pillows! Could you use fleece fabric instead of felt? Do you have a copy of the template you used? 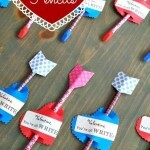 Thinking of using this as a craft at my daughter’s birthday party.